Macrophage attacking bacteria. 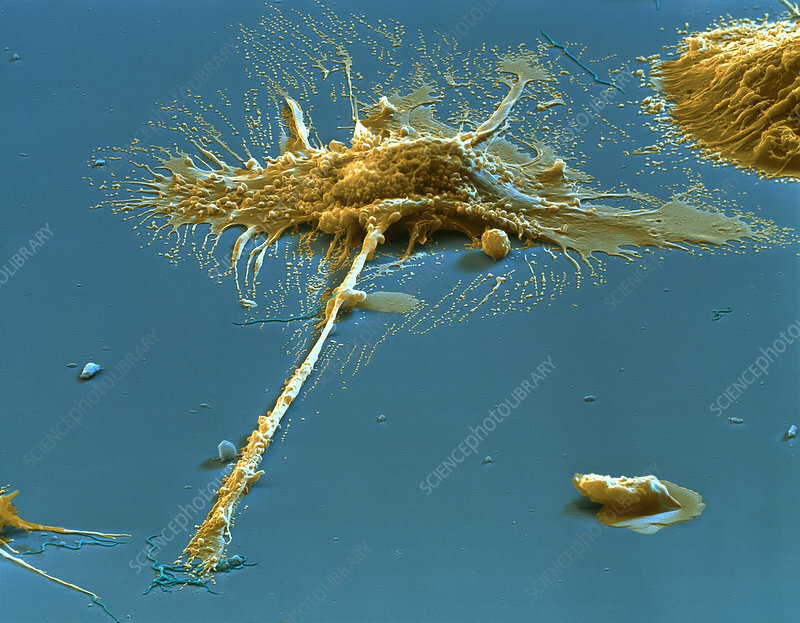 Coloured scanning electron micrograph (SEM) of a macrophage white blood cell (brown) attacking a group of Borrelia sp. bacteria (blue, lower left). The macrophage has extended a long pseudopod towards the bacteria prior to engulfing them. Once engulfed, a process known as phagocytosis, the bacteria will be destroyed. Macrophages are white blood cells which attack many types of foreign organism in the body, including bacteria. Several diseases are caused by various types of Borrelia sp. bacteria, including Lyme disease and relapsing fever. Magnification: x600 at 6x7cm size.